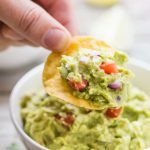 Quick and easy Guacamole, SO much tastier than a store bought variety! Gluten Free, dairy free, vegan, vegetarian, paleo, primal, and Whole 30 compliant. Mix all the ingredients together in a bowl, make sure you add the lemon juice right away so the avocado does not brown. You can use a knife to cut into the avocados and then mix it with a fork, but I think it's easier to use a potato masher if you have one. If you want it really smooth then add it to a blender and whiz it until its as smooth as you like. Taste it and add salt and pepper as needed. If you are making this ahead of time put it into a bowl or container and put cling wrap right on top of the guacamole so that it's not exposed to the air, even though it has lemon juice in it, it will turn brown eventually.